Engraved plate from Ogilby’s 1660 Bible illustrating the state of paradise at the moment of the Fall. The plate was engraved by Pierre Lombart (1620?–1681). From catalogue no.1. In 1660, John Ogilby (1600–76) reissued the large folio Bible of 1659, published by John Field, the printer to the University of Cambridge, with a number of additional engraved plates that he had selected. Field’s Bible was sponsored by Samuel Hartlib’s friend, John Worthington, whilst he was vice-chancellor, in order to ensure the supply of a well-printed edition of the Bible for use in churches or libraries. Worthington told Hartlib that ‘For a fair large letter, large paper, with fair margin, &c., there was never such a Bible in being’ (Diary and Correspondence, vol. 1, p.119). Most of the edition was, however, bought up by Ogilby. The plate which is displayed here was engraved by Pierre Lombart and illustrates the story to be found in Genesis, chapters 2 and 3, although it is usually bound before the opening of the Old Testament at Genesis 1. It shows the Garden of Eden, with Adam and Eve on either side of the tree of knowledge, around which the serpent coils as it places a fruit from the tree into Eve’s right hand. Surrounding this scene are the various animals and birds which inhabited the Garden: peacocks, pheasants, monkeys and squirrels populate the branches of the tree; birds fill the skies around it, and on the ground a wide variety of animals co-exist without fear of one another or of the man and the woman. These animals include fabulous beasts, such as the unicorn. Ogilby had a varied career, originally as a dancing master, but later as a director of plays, a translator, a poet, and, most importantly, a bookseller and publisher. Until his stock was consumed by the Great Fire of London, in 1666, Ogilby specialized in the publication of illustrated works. He had been particularly impressed by the production of the London Polyglot Bible (catalogue no. 73 ), and especially by the plates engraved for it by Wenceslaus Hollar. As a counterpart to the Polyglot, he planned an edition of the Bible in all the major modern European languages (which was never undertaken), and a fine folio English Bible, which, in the end, was produced in time to be presented to Charles II on his first coming to the Royal Chapel at Whitehall in 1660. For this issue, Ogilby supplied eight whole sheet engravings, seven of which were by Hollar, and had been intended as illustrations to the Polyglot, and one of which was by Lombart. Ogilby illustrated most copies of his Bible, however, with cuts bought from the Amsterdam publisher, Nicolaes Visscher (see catalogue no. 7 ). 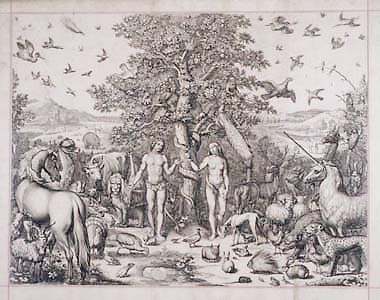 Visscher supplied Ogilby with sets of engravings from his own stock, most of which were the work of Cornelis Visscher, after Rubens, de Vos, de Bruyn, Tintoretto and others. Ogilby’s ventures were successful in winning him royal favour, and, after the disaster of the Great Fire, he received a licence as a cosmographer and geographic printer, and embarked on the work of surveying Great Britain. Ogilby’s Bible was a very expensive book, and large paper copies of it may have cost as much as £25, even in sheets. It was not a financial success, however, and Ogilby failed in his attempt, in 1661, to have the publication of other illustrated Bibles prohibited for ten years. Though criticized later for inaccuracies in its printing, it presented the standard text of the Authorized Version in perhaps the most impressive form available in the mid-seventeenth century. Its illustrations were works of the best artists, and allowed those who could afford the book to visualize the events of the Bible in a grand style. Although Samuel Pepys complained, when offered a copy, that ‘it is like to be so big; that I shall not use it, it being too great to stir up and down without much trouble, which I shall not like nor do intend it for’ (Diary, vol.7, p.237–8), Ogilby’s Bible found favour as a gift, for example accompanying Sir Richard Fanshawe on his embassy to Portugal in 1660. News of the printing of Field’s edition of the Bible, and perhaps of Ogilby’s plans for it, had excited Henry Oldenburg to write to Hartlib on the 2nd July 1659, asking after ‘that gallant new Edition Bible printing at Cambridge’ (Hartlib Papers, 39/3/28A–B). T.H. Darlow and H.F. Moule, Historical Catalogue of Printed Editions of the English Bible 1525–1961 (revised and expanded by A.S. Herbert, London, 1968), p.206, nos.666 & 668; T.S.R. Boase, ‘Macklin and Bowyer’, Journal of the Warburg and Courtauld Institutes, vol. 26 (1963), pp.148–77; David McKitterick, A History of Cambridge University Press: Volume1: Printing and the Book Trade in Cambridge, 1534–1698 (Cambridge,1992), pp.327–8; Margaret Schuchard, John Ogilby, 1600–1676 (Hamburg, 1973); Margaret Schuchard, A Descriptive Bibliography of the Works of John Ogilby and William Morgan (Frankfurt, 1975); JamesCrossley (ed. ), The Diary and Correspondence of Dr. John Worthington (2vols. in 3 parts, Manchester, 1847–86, Chetham Society, vols.13, 36 & 114), vol.1, pp.119,191,192,352&355; Calendar of State Papers Domestic (1661–2), pp.67–8; Robert Latham and William Matthews (eds. ), The Diary of Samuel Pepys (11 vols, London, 1970–83), vol. 7, pp.237–8; John Loftis (ed. ), The Memoirs of Anne, Lady Halkett and Ann, Lady Fanshawe (Oxford, 1979), p.143.